Before I left the states I had been working on a discipleship program that would be tailored to meet the needs of the culture here in Trinidad. Over the past couple of months I have had the opportunity to complete the curriculum and take my first two students through the seven week program. When Mahadeo first came to our church he had a burning question, “How can I know that I will go to heaven when I die?” Mahadeo has looked many places for the answer, his family is Hindu, he attended an Anglican school as a boy, and for the last 20 years he has been receiving visits, literature, and instruction from Jehovah’s Witnesses. 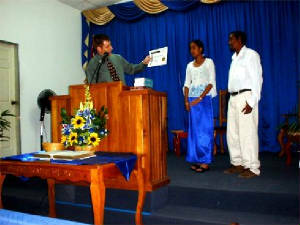 Several of us in the church spoke with Mahadeo and he finally made a profession of faith in Christ. Mahadeo began bringing his daughter Karen to church with him, and so I signed both of them up for the seven week discipleship course. After the first lesson, Karen indicated that she had put her faith in Christ. However, Mahadeo still did not believe that Jesus was God. After the third lesson Mahadeo was convinced that Jesus indeed was God, and indicated that he was trusting Christ alone for eternal life. This really made me realize the importance of discipleship! Mahadeo had made a profession of faith at church without believing that Jesus was God! By following up with the discipleship course we were able to introduce Mahadeo to the real Jesus! This past Sunday we recognized their completion of the course and awarded them with a Bible and a devotional commentary. It has been a great joy to see them grow spiritually! Please pray that they will continue to “grow in grace and in the knowledge of our Lord and Saviour Jesus Christ.” Also, pray that the rest of Mahadeo’s family would come to know Christ as their Savior. Ready, Willing, and Able to Disciple New Converts! Last newsletter I shared with you how that I had been developing a discipleship curriculum especially tailored to meet the needs of the culture here in Trinidad. Last letter featured an article about the first new converts that I had taken through the seven week discipleship program, Mahadeo and his daughter Karen. I am happy to report that they are still coming to church, and there is continuing evidence of growth in their lives. Mahadeo’s wife, Veena, has come to church once but continues to cling to her Hindu background. Please keep praying that Veena and the rest of Mahadeo’s family will come to know Christ. In addition, I have also been teaching a class that instructs mature believers on how to win someone to Christ and then disciple that new convert with the materials that I have produced. 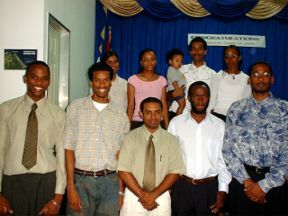 June 6, 2004 we had a special graduation service for those that had successfully completed this Disciple Leadership Training Class. Perhaps the most exciting thing that has happened through the course of these lessons is that I have seen several of the students put the information and the tools to use. The young man pictured to the far left, Brian, has certainly gone beyond mere theory and put the principles into action. During the soul winning portion of the class he led six people at his school to Christ. Currently, he has four young men at his school that he is discipling, using the materials that I have given to him. Brian shared with me that many times the students have mentioned to him how thankful they are to God, for material that is so easy to understand. 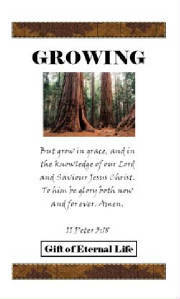 Read more about how God is using the GROWING Curriculum in the hearts and lives of new believers!